Ready to serve potato, leek and bacon soup. These instructions are a guideline only. Important: Do not place this pack directly into the microwave. 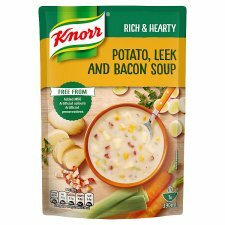 As with homemade soups separation of the product may occur. The typical consistency of the soup will resume upon heating up. Attention: Instructions based on a 900 watt oven. All microwave ovens vary.